Happy Holidays! Merry Christmas! Happy Hanukkah! Happy Winter Solstice! Happy Saint Stephens Day! Happy New Year! May whatever holidays you celebrate this season be merry and bright. This past week, in addition to the usual holiday madness, we celebrated a few December birthdays and I used the occasion as an excuse to check off a few French Fridays with Dorie recipes. For dinner we had Bistrot Paul Bert Pepper Steak (recipe posted by Dorie here) served with roasted potatoes (as close to pommes frites as I can bring myself to make at home) and salad with homemade blue cheese dressing. And to round out my bistro menu, this week’s FFwD recipe, Creme Brulee. First, let’s talk steak. During my semester abroad in France I lived with a french family and ate dinner with them every night. On the occasions when steak was served I had an up close look at one of the culinary differences between typical american and french tastes. My french family would throw their steaks into a very hot pan, sear it a minute or so on each side, and then sit down to eat a steak which, as far as I could tell, was still mooing. They would good-naturedly leave my steak in the pan to let it come to what most american restaurants would consider medium, and what they called burnt. Vive la difference! These days I like my steak more on the rare side, which is a good thing because I still enjoy traveling to France and rare is about as well done as one can get a steak there. True to its origins, Dorie’s pepper steak recipe calls for cooking filets mignons 2 to 3 minutes on each side, and then deglazing the pan with a bit of cognac and cream (it’s a french recipe after all). The resulting steak is rare and absolutely delicious! The perfect birthday indulgence. And since no birthday is complete without dessert, let’s talk about Dorie’s Creme Brulee. Now, I’ve cooked many a creme brulee in my life, and I’ve eaten many more, but I’ve never come across one with jam. Yes, jam! Dorie’s recipe calls for a spoonful of jam as the base layer of her creme brulee recipe. Definitely a first for me. 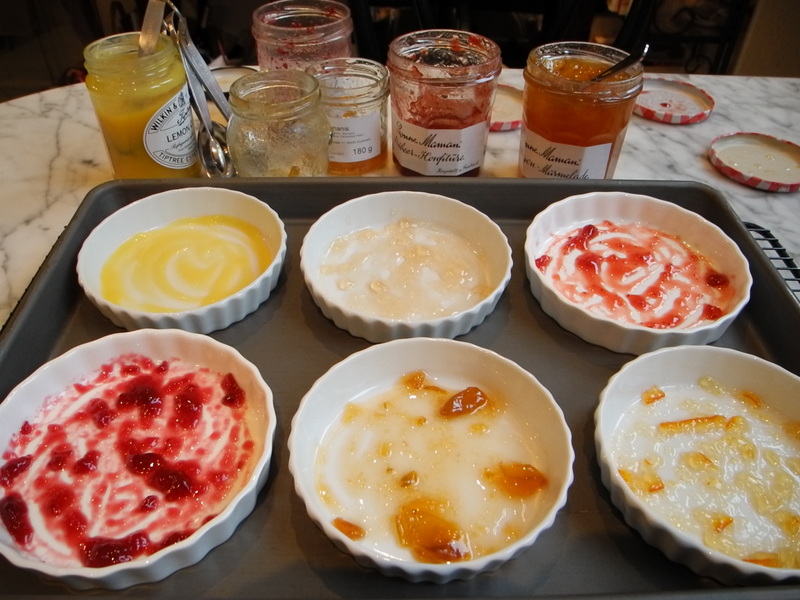 And, as I currently have a rather large number of half-finished jars of jam in my fridge, I decided to use a different one for each dish so that we could taste test and see which one we liked best. My favorite turned out to be the pear-ginger and my husband’s was mirabelle, but aside from the lemon curd (which we both agreed was the only one which didn’t work) they were all quite tasty. As for the more technical aspects of this dish, this was the first creme brulee recipe I have ever seen which did not call for the custards to be baked in a water bath. In fact, every other recipe I have ever read pretty much insists that a water bath is the only way to cook the custards evenly, however, Dorie’s came out perfectly cooked with no problems. I’m still wondering why that is. Are all the other recipes just overly cautious? Or is Dorie’s recipe different in some way which makes it possible to bake without the water bath? I’m stumped. This entry was posted in french fridays with dorie and tagged Around my French Table, beef, dessert, main course. Bookmark the permalink. Dorie’s recipe is different in that it calls for a MUCH lower temperature. Which, in my case (and a few of the TWD people) meant it never ever set. So glad yours did – this looks like a delightful meal!!! Interesting. I have to say that I really liked this method, probably because maneuvering a sheet of boiling water in and out of the oven is such a hassle. I’m definitely going to give this method a try again in the future. Yours turned out beautifully! Happy Holidays to you and your loved ones! That looks restaurant-perfect! Nice and crusty. Happy birthday and happy holidays! I like how each ramekin got a different jam, and I can see how lemon might not work. Thanks, it was fun to try all the different flavors and see which ones worked best. And I actually had doubts about the lemon curd from the beginning, but since we had 6 desserts for just the two of us I thought it was the perfect time to experiment. Great menu! I’m all for rare steaks and never succeed in convincing American boyfriend to try anything less than medium. Vive la difference indeed! What a great way to use up some jam! The pear ginger does sound very good. Your creme brulees look wonderful. Beautiful meal and creme brulee! Your comments on steak made me laugh – I’m from Montana, and my grandpa was a cattle rancher so you can imagine the rareness of the steaks we had! I love the idea of pear ginger jam with this. Happy Holidays to you and your family! Wishing you love, laughter and good cheer! What a fabulous meal! And I adore all of your different flavours of brulee. Merry Christmas! Thanks, Merry Christmas to you too. Your dinner looks marvelous! I missed out on the Paul Bistrot steak, so will have to make that some time. Your creme brulee turned out perfectly. I hope you have a very Merry Christmas! Dorie’s bistro steak is definitely a winner. I’ve done a similar pan sauce with red wine before but never with cognac and it’s quite tasty! That looks like a fantastic ffwD dinner! Happy holidays! Now that’s one heck of a delicious meal! 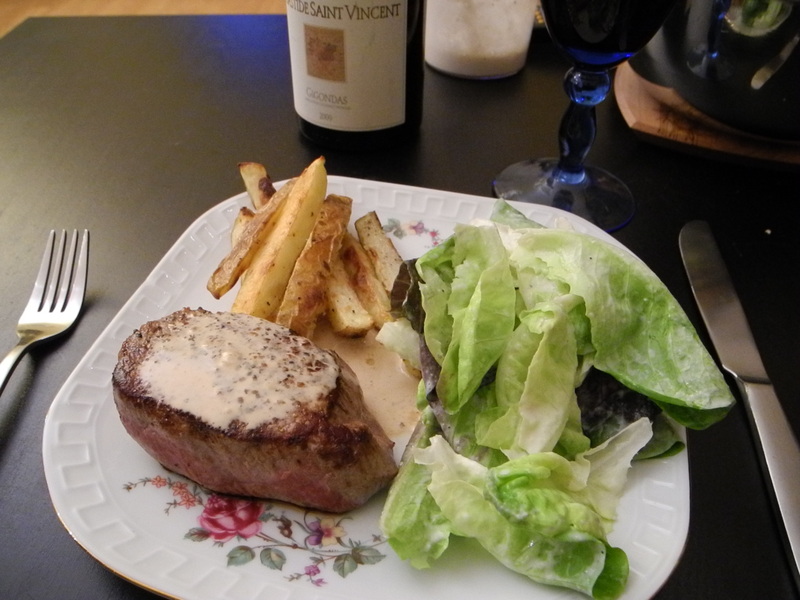 My husband likes his steaks mooing…and he really loved these steaks! Great idea on the creme brulee jam sampler…the pear ginger sounds wonderful! Wishing you a Merry Chirstmas! Love the idea of using the variety of yummy jams that we all tend to accumulate in the fridge 🙂 Your entire meal looks fantastic and reminded me of how much we all enjoyed that steak – I must to it again soon. I have to say that your creme brulee looks outstanding. Love that you put the spoon right out there in the photo as I associated the lovely dish with much “tap tapping” to accompany the whole process. Creatures of habit indeed. Happy New Year !!! 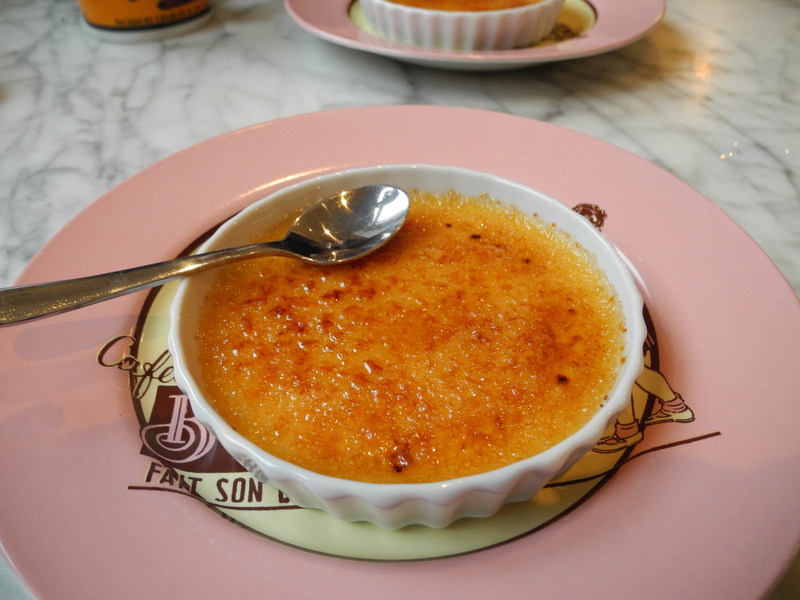 I know, after seeing Amelie, I will never again be able to eat creme brulee without thinking about the ”tap-tap”. Part of the ritual isn’t it! Your birthday dinner looks FAB!!! oh, and Happy Birthday!!! I think its so much fun that you decided to put different jams in each dish! I bet that was fun to eat! We went with fresh fruit ourselves 🙂 OMG, I have been meaning to make the steak and now I wish I had chosen to do that instead of making a small turkey for the three of us, although the husband unit might have protested. A LOT. LOL!! Well Happy Christmas!!! That looks like an excellent birthday dinner, Rose! Yum! I love how you used all different jams in the bottoms. I particularly like your photo with the open jam jars and the empty dishes. Happy Everything to you too. Thanks! I was rather socked to find that I had so many jars of open jam in the fridge. In fact, I think we need more recipes which call for jam so I can work on using them up. I love the idea of trying different kinds of jam! How fun. I’ve never seen pear-ginger jam, it sounds excellent. Your creme brulees (and the rest of your dinner) came out beautifully! I had actually never heard of it before either, but our local farmers market has a jam lady who sells any number of seasonal varieties. What I love is that she always lets you taste them before you buy and last time we were there the pear-ginger was my favorite. It’s just delicious.